Have You Ever Wondered How a Quilt Design Comes to Be? Maybe you are already familiar with the 2018 Row by Row Experience. If not, I'll try to give you a brief explanation. Since 2011 quilt shops across the United States, Canada, and Europe have joined together during the summer months to participate in a program to offer customers, who visit their shop, a free pattern. I have designed "rows" for several different shops the past few years but this year brought on a new challenge. Eight of my local quilt shops in the Raleigh and Cary area of North Carolina decided to get together to create a quilt of rows which would go together to create one quilt design. When they asked me to design the quilt, I experienced many emotions, excited, honored, nervous, "What was I thinking! ", etc., you get my drift. The theme for 2018 is Sew Musical, which could be interpreted in so many ways and if you know me at all, you realize that I am an "outside the box" kind of girl. It was nice to be able to focus in on one concept when the shop owners agreed on a Jimmy Buffett themed quilt. I started the designing process before Christmas. The biggest challenge was that the "rows" were actually blocks of specific sizes this year and I had to figure out how to get eight blocks of specific sizes to work together. Next, I came up with some sketches for design ideas and then needed to arrange them into a workable solution. You will notice that not all of my original ideas "made the cut". In the end, and after many hours of reworking the design, I was able to come up with a workable solution. You may be able to recognize a few of the songs represented if you are a Buffett fan. If not, this would still make a great quilt for a beach house or for someone who simply loves the relaxation of being by the sea. The white lines show the separation of each of the rows/blocks and are not visible when they are sewn together. Each of these shops also have laser cut and regular fabric kits available for purchase. After the RxR Experience is over, on November 1st, I will have the full pattern available on my website for purchase. I will also be offering this as a class next June on a cruise with Royal Caribbean's Harmony of the Seas, June 16-23, 2019. Save your spot today by contacting Dawn Olmstead at QuiltandCruise.com. Charge up your GPS and have fun collecting Rows on your travels this summer! Maybe I will see you in passing! Sometimes life throws you a curve ball. I was supposed to leave today to teach and vend at Quilt Festival in Chicago. After the show we had tickets to see Hamilton. The following day we were to drive to Paducah, KY to vend at AQS Quiltweek . If you are scheduled to be in my class in Chicago this week, I apologize, but I had to find a replacement to teach my class. You should receive a separate email from me regarding this issue. I totally enjoy my job. There is something to be said about being your own boss, doing what you love, and meeting people who enjoy the same things that you do. My job consists of creating applique quilt patterns, teaching classes, traveling, and vending at quilt shows. That is the fun side, however, there is so much that goes on "behind the scenes" including lots of admin work, which takes up a huge amount of time. I'm not kidding when I tell people that this is a full-time job. Every year I say that I will be "cutting back" on the amount of travel and shows that I do, and every year I seem to add "just one more thing". Recently, I had a wake up call, which has made me rethink my priorities. On March 28 I had lunch with a friend. As I left the restaurant to get into my car I noticed that my heart was racing and my chest began to hurt. I had noticed previously, for about three weeks, that I had been having shortness of breath when climbing just one flight of stairs. Because of these previous symptoms, I had made a doctor's appointment to discuss these issues with my primary care doctor. My appointment was on March 29, my birthday. When the racing heartbeat and pain in my chest began, I quickly realized that this was something serious. I was able to check my heart rate on my Apple Watch and realized that I was experiencing 122 beats per minute, my normal resting heart rate is generally around 54. Three thoughts went through my mind at this point, drive home, drive myself to my primary care doctor, or drive directly to my local hospital. I chose option number three. Granted, this was probably not the best idea, driving yourself to the hospital while having a heart attack, and for future reference I would suggest that you call 911 if you find yourself in this situation. To make a long story short, I was admitted to the hospital and a stent was inserted into one of the main arteries of my heart. It wasn't until the doctors talked to me after the surgery that I realized what danger I had avoided. It seems that I had a 95% blockage of the LAD artery in my heart. This is often called the "Widow Maker". My cardiologist told me that I had "dodged a major bullet" and that if I had waited a week longer to see a doctor that I would not be sitting here today. You may have read my post on this on my Facebook page, if so, I apologize for repeating it here. However, since not all of my readers subscribe to Facebook, I thought this info might help someone else to be more informed. Fortunately for me, I had read up on symptoms of heart attacks in women, as I know that they present themselves differently than in men, and I was prepared. My advice to you is to listen to your body. I have no history of heart disease in my family, I am not overweight, I don't have high blood pressure, I do not sit around, and I eat healthy. I do, however, have a history of high cholesterol in my family. If you are a woman, please read up on signs of a heart attack in women. That description of an elephant sitting on your chest may not be what you feel. In my case that "elephant" must have been a baby one because, tome, it was bearable, although I do have a high tolerance for pain. I'm currently at home for a few weeks, "taking it easy". I will resume my "new normal" schedule shortly and hope to see many of you at future shows and classes. What a great week we have had in Pigeon Forge, TN at the Mountain Quiltfest! This is my first time visiting this lovely little city and I must admit I was a little surprised at all the opportunities for entertainment along the way. Dinner shows of every kind, ferris wheels and roller coasters, and great restaurants galore. The hospitality in this area is unbeatable and what a wonderful time I have had vending and teaching at the Quiltfest. My machine appliqué class on Thursday evening included 20 eager students. Although they were a little tired from previous shopping and classes all day, they still managed to come with the enthusiasm and curiosity that makes for a great class. Sometimes people come into my booth who have never done appliqué before and are scared of the process. I do my best to walk them through the process to ease their fears. Often times, I'm successful, sometimes though they are still resistant. So, it was such a surprise Friday afternoon, just before the close of the day, that four sisters returned to my booth to show me what they had accomplished overnight. These ladies came into my booth on Thursday and fell in love with my giraffe quilt, My Favorite Earrings. They hesitantly purchased the kit and came back later in the day to ask a few questions on what they should do to get started. I gave them a quick little tutorial on tracing out their pattern pieces onto Heat 'n Bond Lite and using an appliqué press sheet. Imagine my surprise today when they returned to my booth to show me a photo of the progress they had made overnight! Three of the sisters worked together and stayed up until 2:00 am tracing, cutting and fusing until they had both giraffes ready for the final fusing to the background fabric. Now, all they have left to do is the stitching around the individual pieces. You know how much I love seeing the projects that you guys make from my patterns! This was especially exciting for me to see the pride and sense of accomplishment that these ladies had achieved. Congratulations to Ellen, Helen, and Bobbie for a job well done! If you are new here, I'm glad you found your way to my little corner of the world. I'm participating in a Blog Tour called BERNINA Ambassadors - Telling Our Stories, and today is the day that I get to tell mine. If you are a regular reader of my blog, you may already know a few of these little tidbits but sit back and relax as we get to know each other. My name is Sandy Fitzpatrick and I am a pattern designer, teacher and lecturer of machine appliqué and free-motion quilting. Sewing has always been a passion of mine and I get no greater joy than teaching and sharing my techniques with others. I became an official BERNINA Ambassador about two years ago, but I've actually been a BERNINA advocate for almost 40 years! I had previously owned another brand of machine which "gagged" whenever I tried sewing over elastic. Since I was making clothes for myself and my children at that time, it was really frustrating trying to find a "work around" to my stitching problems. When I had the opportunity to sew on and purchase my first BERNINA I thought I could hear angels singing, as all of my stitching issues seemed to vanish. I couldn't believe that a machine could make that much difference in my sewing capability. As Ambassadors we also create great tutorials on the We All Sew blog. Here are a few links to some posts which I have previously written. For years, I made my own clothes and, as my children came along, I made hand smocked outfits for each of my three kiddos. This worked well for a number of years. With two girls and a boy, I would make coordinating smocked outfits for Easter and Christmas along with the normal "church" clothes for the rest of the year. When our son was about four years old, I made coordinating sailor outfits for Easter. On Sunday morning when it was time to get ready for church, my son refused to put on the knickers and smocked shirt that I had so lovingly made. Frustrated, I stomped downstairs and told my husband, "You go talk to him!" About five minutes later, my son came strutting down the stairs, proudly wearing said smocked outfit. "How did you do that?!" I asked my husband. He said, "I told him I'd give him a dollar if he would wear it to church." Let's just suffice it to say that I never made him another smocked outfit. When my kiddos outgrew these smocked clothes, I had to find another direction in which to focus my sewing. I decided to try quilting, and found my new passion. I began by making traditional quilts, but soon realized that appliqué was more forgiving and I didn't need as many math skills. It didn't take long for me to realize that I enjoyed creating my own appliqué patterns. When friends started asking me to create patterns of my designs, I realized that perhaps I could turn my fun little hobby into a business, and Hissyfitz Designs became a reality. I currently have a line of patterns that are a little outside of the box. I once had a customer tell me that I didn't even know where the box was. Hmmm... I guess I'll take that. Anyway, you may find me vending and teaching at quilt shows throughout the U.S. As we speak, er, I mean type, I am teaching and vending at A Mountain Quiltfest in Pigeon Forge, TN and next week you will be able to find me at AQS Quiltweek in Lancaster, PA. I am currently working on new patterns for Quilt Market in St. Louis in May so keep a lookout to find them at a shop near you. I hope you enjoy learning about the other participating BERNINA Ambassadors on this little blog tour. Simply click on the names below to get a peek at who we are and what we are all about. Remember that if you are looking for teachers for your guild or local shop we have lots of knowledge and enthusiasm to share! Everyone loves a little free gift! If you have stuck around long enough to get to the bottom of this post, I have a free pattern for you, just by clicking here. A little over a week ago I was enjoying the sunny shores of Daytona Beach, Florida. It was a little chilly for my taste but still warmer than most of the U.S. It wasn't really a vacation for me, as I was attending the AQS Quiltweek Show as a vendor. I must say that I do love attending these shows and being able to visit different areas of the country. This was the second year that the AQS show was in Daytona and it was great to see some returning, smiling faces in my booth. If you have attended any of these shows you know about the amazing quilts on display, such exquisite work! If you were unable to see the show, I'll bring a little of it to you with some of the amazing quilts from the show. March is an unusually busy month for me this year as I have three shows this month. After returning home from the Daytona show it was time to restock my patterns and cut more kits. I'm leaving on Monday for A Mountain Quiltfest in Pigeon Forge, TN. This is my first year for this show and I'm excited to explore a different area. Besides vending at the show, I'll also be teaching Fearless Machine Appliqué. When I return home on the 26th I'll have just enough time to repack my bag before heading off the next morning for Lancaster, PA. The AQS Quiltweek in Lancaster is one I've been attending for several years now and is truly a great show in such a picturesque area, beautiful rolling hills of Pennsylvania and Amish countryside. I hope you are working on something wonderful yourself, and should you be in the area of any of these shows, please stop by to say, "Hello"! I recently had the privilege of having a sneak peek at Lori Kennedy's new book, Free-Motion Machine Quilting 1-2-3. Lori is a regular columnist for the American Quilter Magazine and has a wonderful blog called The Inbox Jaunt. If you are familiar with her work, you know about the amazing designs Lori can create with her quilting. If you haven't seen her work and are interested in applying some free-motion quilting to your own projects, you need to purchase this book for your quilting library. Lori has done an amazing job creating a resource to guide you through the quilting process. What may look like a complicated design once it is stitched out, is actually quite easy and "do-able" using her step by step guidelines. By following her instructions, she will remove any doubt you may have of your stitching ability. The beginning of the book is loaded with information on how to set up your machine, tools to make the process easier, and a breakdown of batting, backing, and threads. As you make your way through the book, you will find simple designs, which gradually morph onto what looks like more complicated designs. However, Lori will guide you along each step so that you will soon be stitching your way through new design elements. 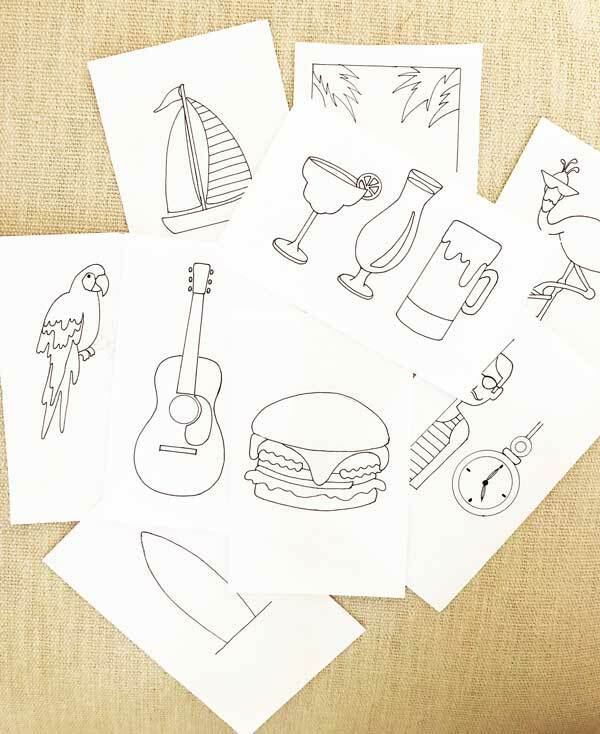 She also includes areas for you to practice doodling designs so that you can get a feel for how the design is created. I have been doing my own free-motion quilting for many years and wish this book had been available to me when I first started out. The information Lori has provided will help remove the fear you may have in attempting your own free-motion experience. I would suggest that you pre-order your book through your local quilt shop now! You may also get your copy directly from Lori at The Inbox Jaunt or through Amazon.com. This is a book you don't want to miss. Do you ever have one of those days when you look in the mirror and decide it's time for a little change? As a pattern designer, we get to make those decisions when it's time to reprint a pattern. This Flamingo Frolics pattern is not new. However, it still remains popular and when I began to run out of the pattern, I had to make a few decisions. Do I keep it in the line, or not? Since it was one of the first patterns I designed, I decided to give it new life by remaking the quilt in updated fabrics and redoing the pattern completely. It is now much easier for you to create, as all the pattern pieces are drawn out separately and ready for you to trace onto fusible web. There are new instructions and a guide sheet showing pattern placement. There is a constant swirl of new pattern designs in my head and I'm working hard to have some new ones ready for Spring Market. But, for now, welcome back girlie, good to see you "keeping up with the times"! Last week I was able to spend a few days in the lovely city of Lancaster, PA while attending the AQS show. It was a very busy week with two lectures, teaching a class on machine applique and vending. After setting up on Tuesday we were able to spend some much needed "down time" taking in the idyllic sites of the surrounding area. We love the Central Market which was first established in 1730. It's the oldest farmer's market in the country and has such a great selection of food, flowers, and crafts. Definitely the best baklava I've ever eaten and the tastiest sandwiches on homemade bread! As we toured the peaceful Amish countryside we went in search of one of the local covered bridges and enjoyed the sites of a simpler life. My class on machine appliqué was such a treat. It's always fun for me to be able to show that there really is nothing to fear with appliqué and that it really can be so much fun, almost like playing with paper dolls. The students were a delight and we even had the joy of having an assistant, as Pumpkin the service dog, joined us for the class. Since Pumpkin has been trained to turn on lamps at home by pressing down on a foot control, we did get quite a chuckle as she decided to take a few stitches on the machine, thinking she was doing us a favor by turning on the lights. Bouquet by Katie Pasquini Masopust from her Paintings in Quilts special exhibit. Now that the show is over, I'm spending some much needed "grandma/honey" time with the grand girls in NJ. We've managed to work in a few art projects of our own. Hope you are spending some time creating something of your own! If you are in North Carolina I hope you are getting your shopping list ready for the Quilting and Fiber Art Marketplace next weekend, Jan 8 and 9 at the Dennis A. Wicker Civic Center. Everyone loves to save a little money so here is a coupon for $1.00 off your entrance fee. Simply print it off and present it at the door. I can finally see the light of day after playing "catch up" on everything that needed to be done after attending Market and Festival in Houston so I thought you may like to see a little of what goes on at these two wonderful shows! Market is for shop owners and others "in the business" to find the latest and greatest among fabric designs, notions, patterns, sewing machines and anything else you can think of, to make your little heart go "pitter-pat"! Since I am a pattern designer, it is the place to be, to show my newest patterns. I introduced two new patterns called, "Kiss My Stash" and "Merry Mouse Mischief" which were both hits! A typical booth at Market starts out looking a little desolate, but within a few hours looks pretty amazing! Within 24 hours the show floor is transformed into something magical, which lasts only three days. Once Market is over, there is a two day break to allow some vendors to move out and others to move in for Festival, which is open to the public. It is a quilter's/sewist's heaven! This year there were about 1100 booths, walking shoes are a must! When customers aren't shopping, they can view the hundreds of award winning quilts in the quilt show. This is just a sampling of the amazing talent displayed by quilters from around the world. We did manage to have a little extra fun since Halloween fell during Festival this year. Hope to see you at a future show! If you've been wondering how to use the blanket stitch on your sewing machine to create the look of a measuring tape I've created a post on just how to accomplish it on your BERNINA. We all love to sew, right? That’s why we’re here! I especially love to create things that depict my passion for sewing. Did you know that you can use the stitches on your BERNINA machine to replicate the look of a tape measure? Not only can it be done, it’s also very easy to accomplish. I used this technique to create a “tape measure” border around my Stitchin’ Addiction quilt and I can’t tell you how many people have fallen in love with this idea. It is basically just three regular blanket stitches and one a little wider. Congratulations to all the lucky winners! They have all been emailed and I am awaiting mailing addresses to send out their loot. I'll be hitting the road again on Tuesday as I head to Spring International Quilt Market in Minneapolis. I have five new patterns that will be debuting for shop owners. You guys already got a sneak peek at two of them, Ha Bum Hug and Flurrious Fun. I'll be posting the other three designs when I return home. Right now I am up to my eyeballs with lists of things to take to Minnesota!